As with any experimental archaeology it is not possible to say: this is how it was done, only: this is one way it could have been done. Plumbatae have been found on several sites in Britain and abroad and written evidence for their existence has been reported in the fourth century by Vegitius. For a long period the method of casting the lead onto the wooden shaft was the topic of much discussion. The difficulty was that it was assumed that when liquid lead was poured onto the wooden shaft it would burn the shaft through, thus making the weapon useless. 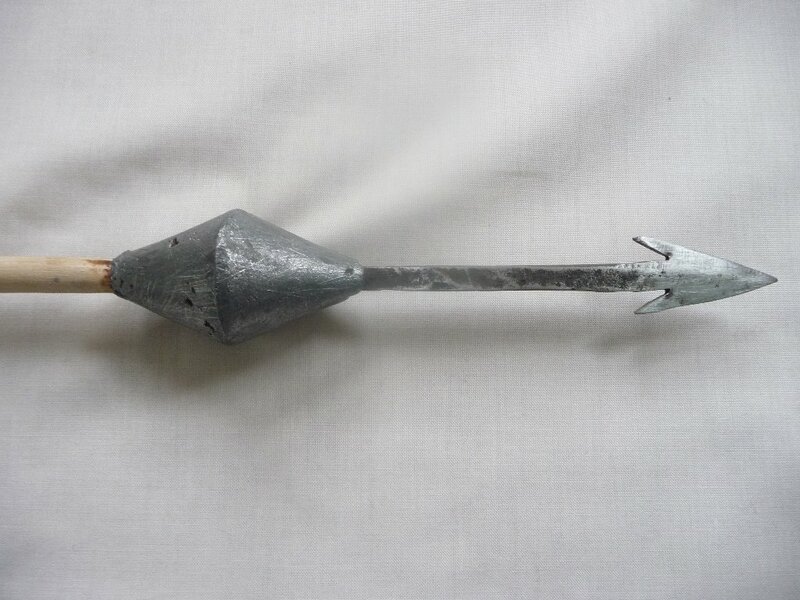 The current author has shown that the casting of lead onto a wooden shaft is a simple and straightforward operation, well within the skill set of any metalworker or armorer (Sim 1995). In the first set of experiments to replicate a plumbata the moulds for casting the weights were made from plaster. It was observed that these plaster moulds had a very short life expectancy and needed frequent replacement. This has implications for the production methods that may have been used, not only to make new plumbatae but to repair those broken in either combat or practice. Field trials with replica plumbatae demonstrated that the wooden shafts broke on four out of every five thrown. This means that if a salvo of 100 plumbatae were thrown, 80 would need to be either repaired or replaced. This large number calls into question the use of clay moulds because of their short life expectancy, so it was decided to try different materials to see if the number of castings could be improved. Table 1 shows the results from experiments with different media used to cast plumbatae weights. Table 1. Experiments with various media used to make moulds. As can be seen from Table 1 the best results were obtained using plaster but even this was unpredictable. In one experiment 11 castings were made; in another using the same plaster only three castings were produced. All the materials varied from one mould to the next. There are several disadvantages in using these types of mould. They are time consuming to produce. Each mould requires approximately one hour to produce but all of them require considerable amounts of time for setting and drying. Moulds for casting liquid metal have to be free from all moisture. The liquid metal coming into contact with any moisture will cause the moisture to form super heated steam and thus will cause an explosion. Wet clay and wet plaster have to be dried slowly to avoid cracking and so there would have to be a constant supply of moulds in various stages of manufacture if plumbatae were made in any quantity. This is uneconomical and wasteful. The use of this type of material to make moulds will cause many difficulties when plumbatae have to be repaired in the field. Transporting heavy material such as clay is a logistical problem and the army cannot rely on clay being on hand in the location where it may find itself. Even if local material were available, the processing of it during times of conflict would have been a difficult task. These experiments have demonstrated that casting plumbatae weights using what is considered to be common media available at the time has considerable disadvantages. These factors have led the writer to consider a different approach. Justification for a different approach. Clay and plaster are not the only materials for making moulds; another alternative is that moulds were made from metal. The use of two-part metal moulds to cast metal in was well known from early times. Bronze moulds for casting bronze axe heads are known in Britain from the Middle Bronze Age (1400-100 BC) (Tylecote 1976). A two piece metal mould for casting bronze axe heads is shown by Aitchison (1960). There are also arrow head moulds from Susa (Tylecote 1976) and there is a multi-part mould for casting socketed arrow heads from Mosul (Marion1961). Other examples of casting from metal moulds demonstrate their use was common and well understood. This shows that the use of metal moulds has a long history and was a well-established method of casting that must have been common knowledge to Roman metal workers. It has been assumed that plumbatae weights were cast onto the head and shaft using moulds made of clay or plaster. To date no findings from the archaeological record support this assumption. On the other hand clay and plaster do not survive well in the archaeological record so there is little possibility that any evidence to support the use of clay or plaster will emerge. It is of course possible that clay moulds were never used at all and metal moulds were used from the start of the manufacturing of plumbatae. The limitations of clay moulds very quickly became obvious to the author during experiments and there is no reason to suppose it would not have become apparent to Roman metal workers just as quickly. 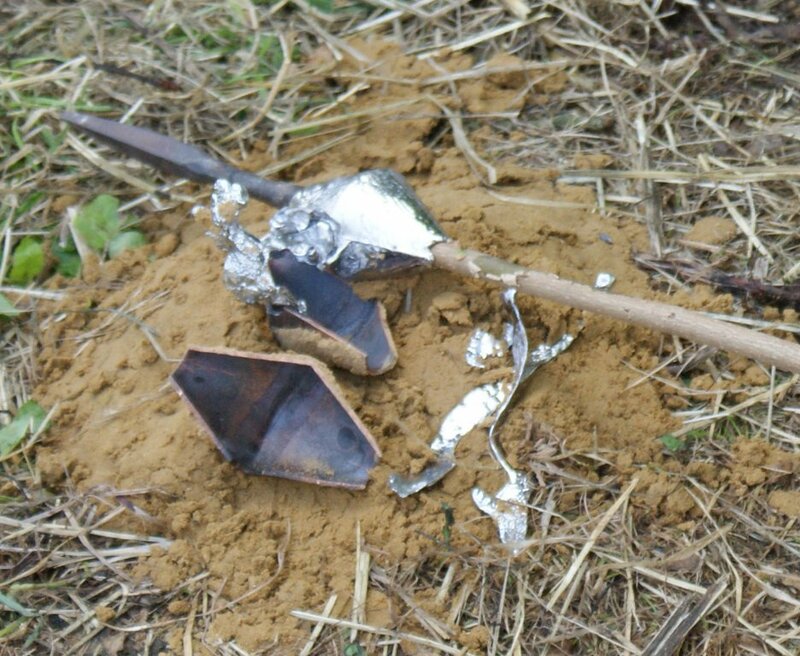 Any manufacturer will always try to find ways of improving his methods of production and armed with the knowledge that metal moulds had already been in use to cast metal, it seems likely that this would have been considered as an alternative by Roman metal workers. Copper and brass were common metals in the Roman period and a there was a plentiful supply of both metals. 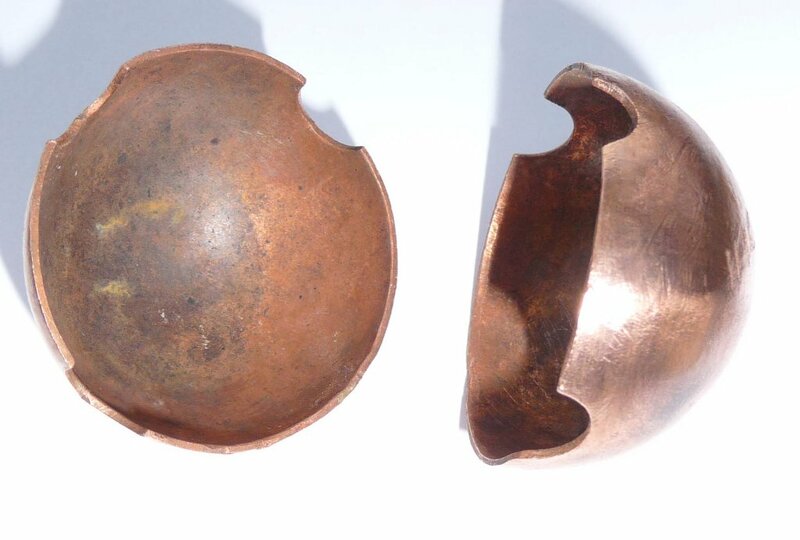 Copper is an ideal metal for making this type of mould. It is a very good conductor of heat and the casting of lead onto wood requires that the heat be conducted away from the wood as quickly as possible. The laws of thermo-dynamics state that heat energy moves from hot to cold. The heat will be conducted away from the lead through the copper mould to the material that surrounds the copper, probably damp earth or damp sand. The heat loss will be very rapid and the heat from the lead casting will be conducted away from the wooden shaft quickly before it has time to heat up and burn. This has already been demonstrated (Sim 1995). In fact a copper mould is likely to transfer heat faster than one made from clay or plaster. 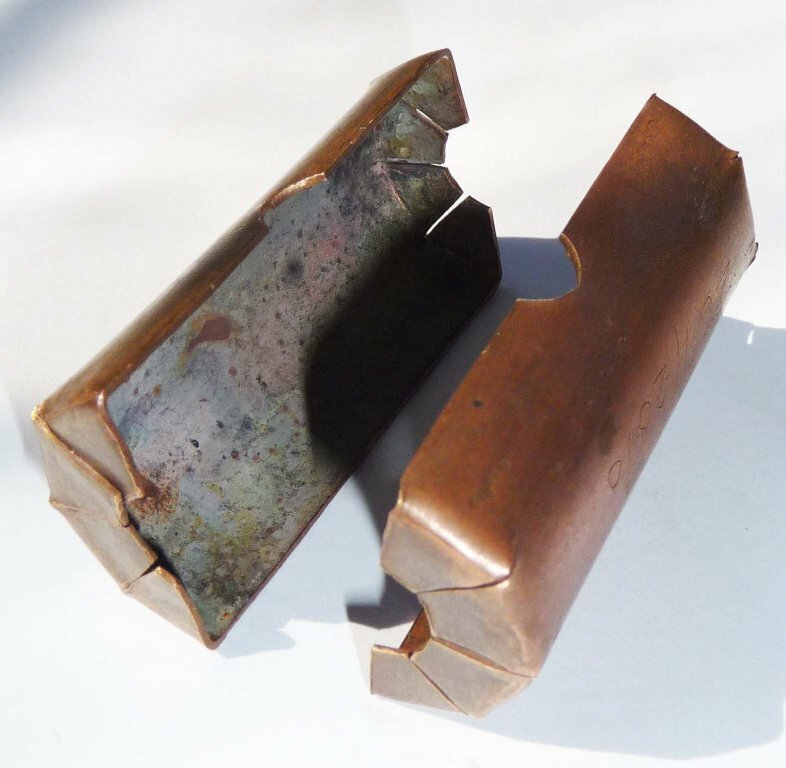 Damage to the copper mould from liquid lead will be negligible, as lead melts at 326°C and copper melts at 1000°C. Because of the rapid cooling of the mould the lead is not in contact for long enough either to raise the temperature of the mould or for it to cause any damage. It makes sense to invest in the time to make a mould that will have a long production life. It was decided to make moulds from copper to determine if the amount of time to make such a mould would be cost effective. 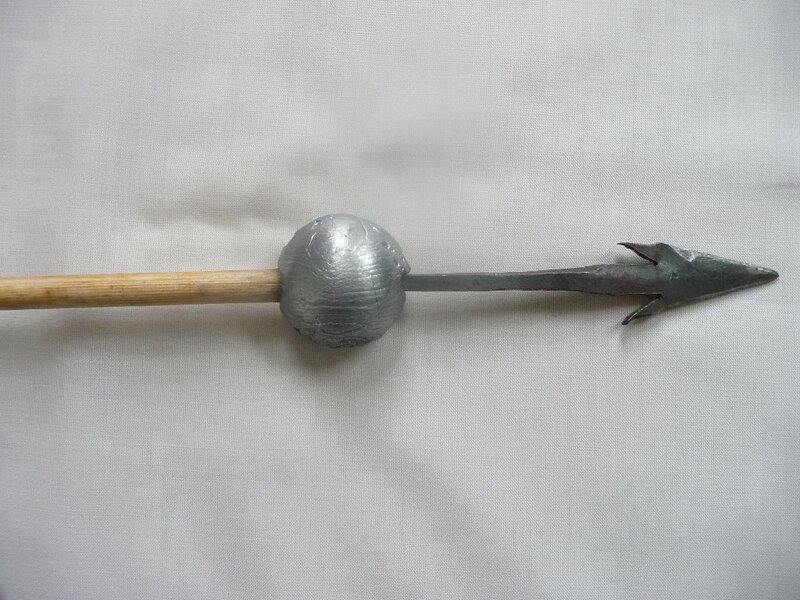 Given that lead was used in huge quantities in the Roman period the techniques associated with the methods of working it would be familiar to any Roman maker of weapons. Adhering to the principle of only making reproduction from the materials available at the time and using only the tools from the period it was decided to make the mould from copper. 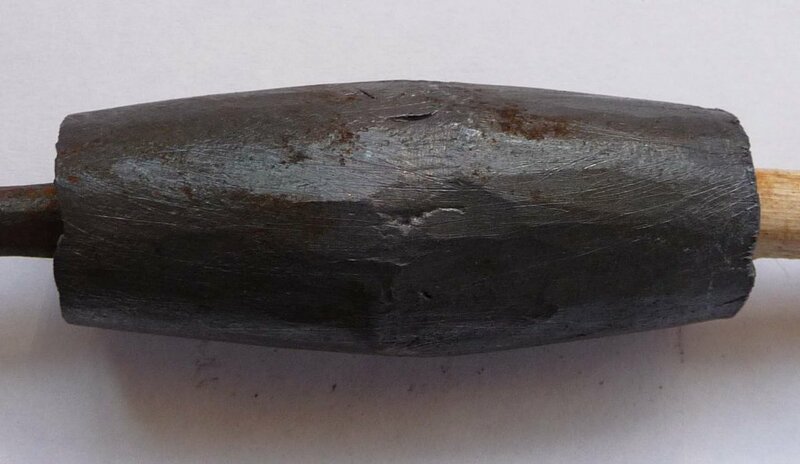 The shape of the plumbata weight made in the first set of experiments is that of two cones joined together at their largest diameter. 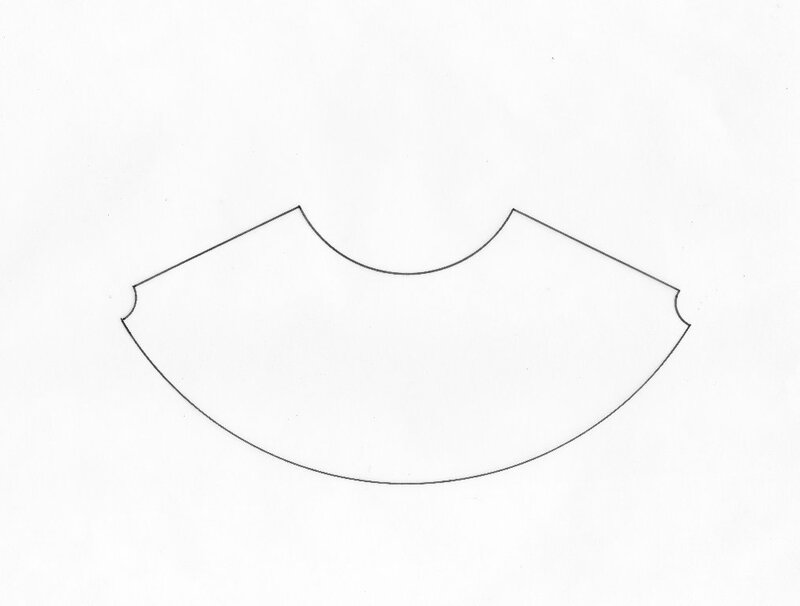 (The two frustums - see Figure 1) It is first necessary to draw the frustum to actual size as shown below. The development of the frustum of a cone is shown in Figure 3 to 10. This sequence of operations shows that the making of such a mould is a piece of simple metal work that any competent metal worker could easily carry out. The production sequence shows a careful drawing of the development of the cone. The author has worked in a tinsmith’s shop and has seen tinsmiths cut developments of cones by eye with no marking out. The cones fitted perfectly. Roman sheet metal workers and tinsmiths would have been no less skilled. The total time to produce this mould was 53 minutes. At the time of writing this mould has produced 63 casting with no visible change to the appearance of the mould’s inner surface. Most two-piece moulds are fitted with devices called registers to make sure both parts of the mould are correctly aligned when brought together. 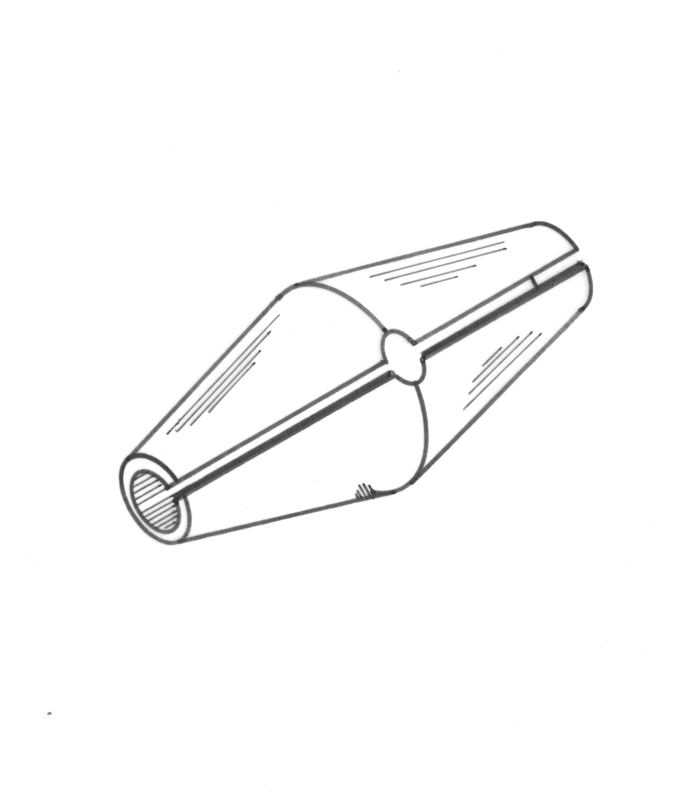 These can be pins or lugs on one half that locate in holes on the other half. In this mould it is unnecessary because the wooden shaft and the shank of the metal head align the two halves of the mould on its long axis and the alignment on the short axis is done by eye. As well as a long life, this type of mould is easy to transport and a legionary could easily have carried one in his equipment. It is unlikely that these moulds would survive as a pair in the archaeological record; moreover, if one side was found on its own, it seems unlikely that its function would be obvious. It is possible to carry the pattern for a clay mould, but it is uncertain that suitable clay or other material would be available at the destination. (The pattern is light but carrying clay would be heavy and there is no guarantee that where you arrive there will be any clay or anything else to make a mould out of). There is also the time to make a mould and cure it before it can have liquid metal poured into it to be considered (See making plumbatae in the field). 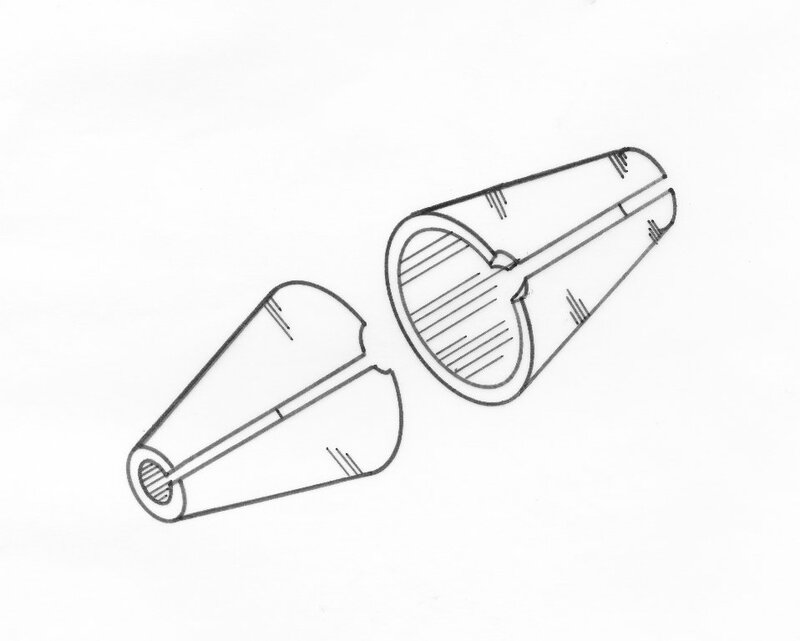 The mould made from two truncated cones requires a soldered joint, though this is a simple matter for any competent metal worker. It is possible that there are times (when in the field) when the necessary equipment for soldering might not be available. Therefore it was decided to investigate the possibility of producing a mould from a single piece of sheet copper. It was decided to make a plumbata with a spherical weight. The reasoning behind this approach is that Vegitus describes legionaries carrying five plumbatae inside their shields. Although no description of size is given, common sense dictates they would not be so heavy as to make maneuvering the shield difficult, nor so bulky that they would interfere with maneuvering the shield during combat. The sequence of operations was as follows. The mould was made from sheet copper 1.0mm thick. Using a pair of dividers a circle 50.0 mm in diameter was drawn. The circle was cut to shape with shears to produce a disc. The disc was annealed. A dome headed wooden mallet was used to hammer the disc into a concave hemisphere in a wooden block. This produced a hemisphere with rough edges. The hemispheres was placed on a flat piece of sand stone and rubbed with a circular motion until the edges were smooth. This was then repeated to produce a second hemisphere and these edges were also smoothed until the edges of both hemispheres fitted with no gap. The two pieces placed together did not form a true sphere but a flattened sphere. Such a weight would be much easier to carry inside a shield and so it was decided to keep this mould and use it for tests. There are three holes in the rim of the spheres: two opposite each other to accommodate the shaft and the head. The third, at 90 to the other two is for pouring the liquid metal into the mould. These were made using a circular file. Total production time 54 minutes. Both halves were produced in 41 minutes. The weight was cast producing the cylinder shown in Figure 14. It was found that the head and shaft were loose. 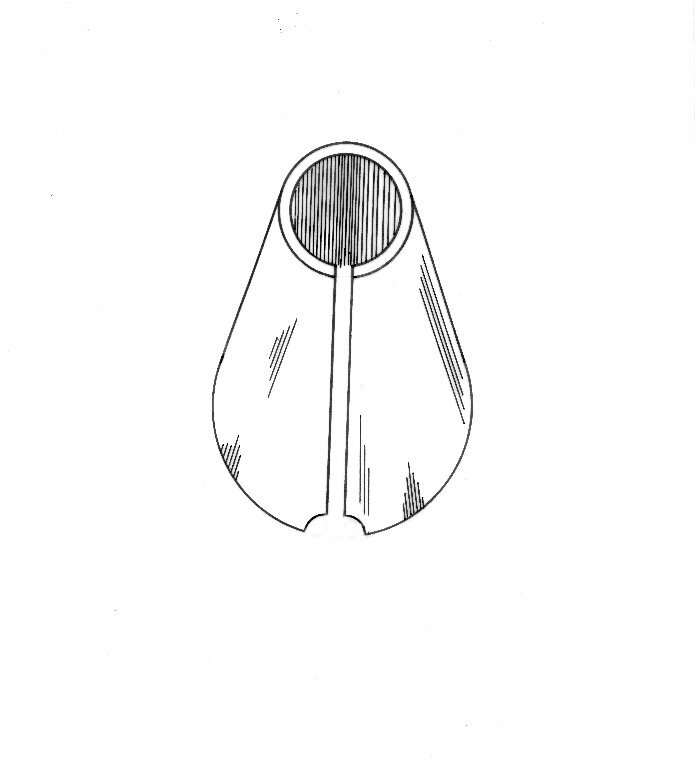 To tighten them up they were hammered on an anvil while being rotated, which produced the tapering cone shown in Fig.15. This is an identical shape to that produced in the first set of experiments. This raises the question: were the original plumbatae found at Burgh Castle (Sherlock 1979, 101) produced by this method? At the time of writing over 70 castings have been made using this method and there have been no separating of the moulds and no spillage of liquid metal during any of the castings. The mould shows no sign of deterioration. The experiments with making clay and plaster moulds have shown that each mould takes a minimum of one hour to make and has a very short life. It seems the out-lay of 54 minutes plus the cost of copper (it can be made from any scrap) is a worthwhile return on the investment. The hemisphere design is made from a single piece of metal and is very simple. If a different shape was required then a punch of that shape could be made in either metal or even hard wood. It would be hammered into a lead block thus producing a die. The sheet metal would be placed in the die; the punch would then be hammered onto the metal driving it into the die and forming the shape. Experiments have shown that making moulds for casting plumbatae from materials such as clay or plaster is a time-consuming and very inefficient method of production. 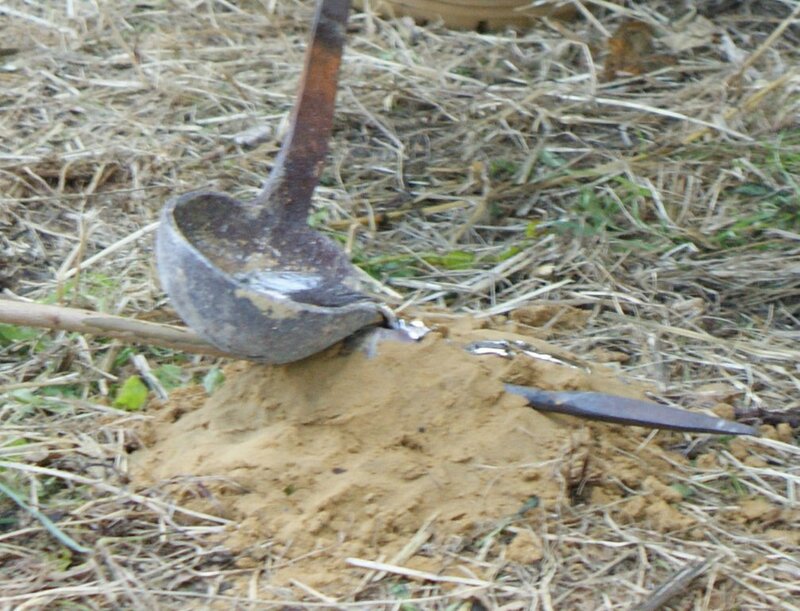 The existence of metal moulds for casting metal objects has been known since the Bronze Age and it is suggested that it would have been known to the Roman workmen. 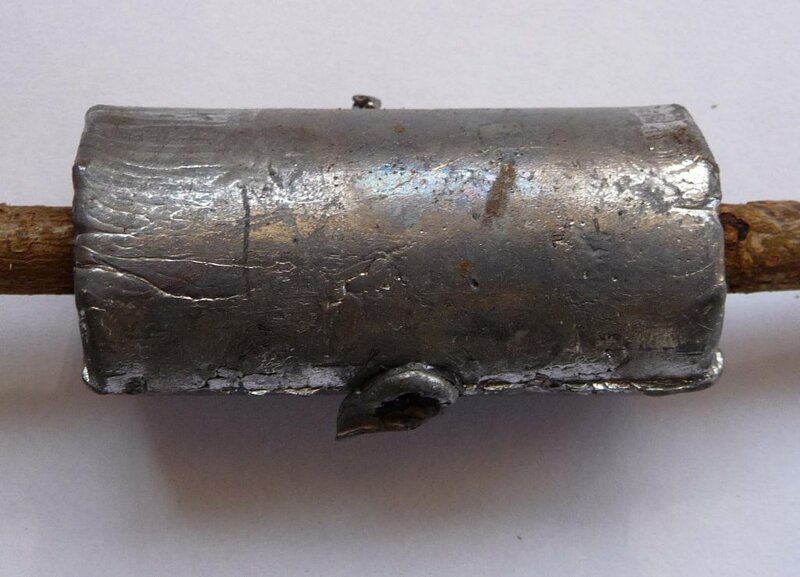 To date no moulds of any sort have been positively identified as being used for casting the lead weight on plumbata which leaves us in the position that the type of moulds discussed in this paper as possible as any other material. It is likely that these moulds have been found but never identified correctly because if only one half is found as is most likely its function will not be obvious. It has not been possible to do any analysis on original plumbata weights. These are disposable weapons and as such cost will be kept to a minimum. Therefore it is unlikely any expensive alloying elements such as tin was added because of the cost. Metal moulds are very robust and would be capable of producing many hundreds of castings. They are also easy to produce, cheap to make, have a long life span and are easy to transport. Metal workers transporting their moulds is discussed by Aitchison (1960). 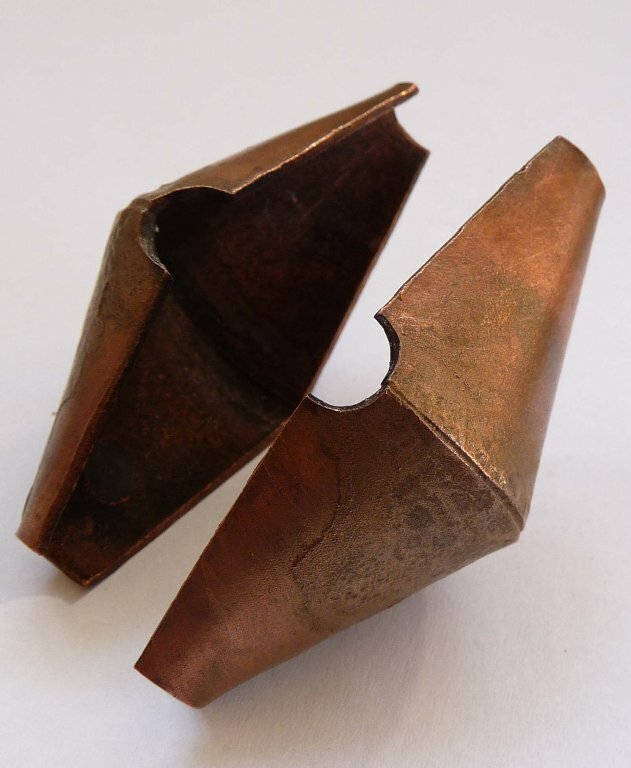 It has been shown that a simple and very efficient mould can be made from copper sheet, and that such moulds can be produced using only basic metal working techniques. It is not work needing a highly skilled craftsman. These experiments have been conducted to show the minimum that would be needed to make these moulds. 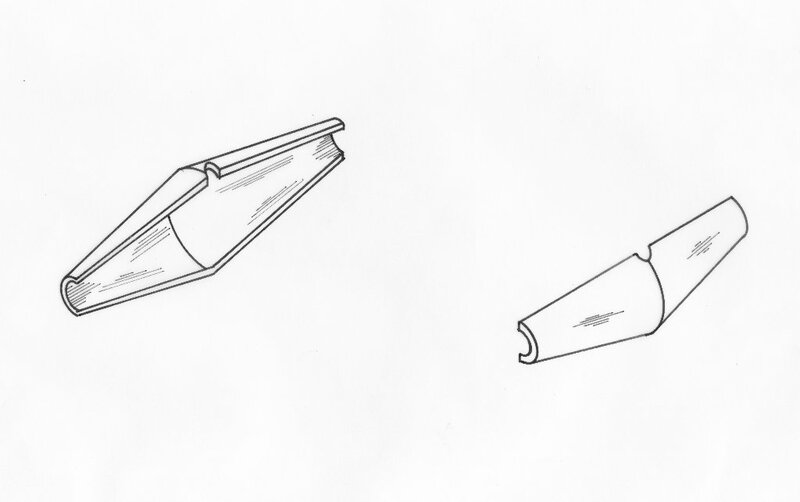 It is possible that some form of attachment such as a chain could have been added to keep the two halves of the mould together or they could have been attached to tong ends for faster production. From their appearance it is unlikely that such items found in the archaeological record would be identified as moulds for casting plumbatae. 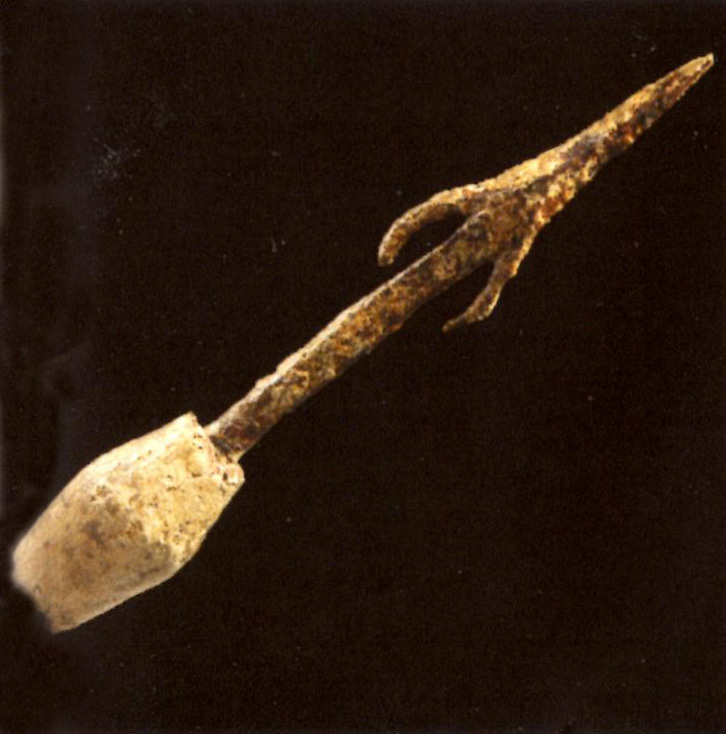 This plumbata was made using only the tools and equipment available during the Roman period. The supply of large numbers of these weapons would not be a difficulty for either an individual manufacture supplying the army or for a legionary workshop. Both would have easy access to all the materials necessary to produce plumbatae. I would like to thank Clare Farley for all her help in the preparation of this article and Dr Jamie Kaminski for his reading of the finished draft. I would also like to thank Dr. Jerome M. Eisenberg Director of Royal Athena Galleries for his kind permission to reproduce the photograph of the original plumbata. AITCHINSON, L., A history of metals, London, pp. 303 pp, 347, 1960. SIM, D., "Experiments to examine the manufacturing techniques used to make plumbatae", The Arbeia Journal, vol. 4, pp. 13-20, 1995. TYLECOTE, R-F., A history of metallurgy, London, The Institute of Metals, pp. 182, 1976. Fig 6. Two cones formed. Fig 7. Two cones soldered together. Fig 9. The finished mould. Fig 11. The finished mould. 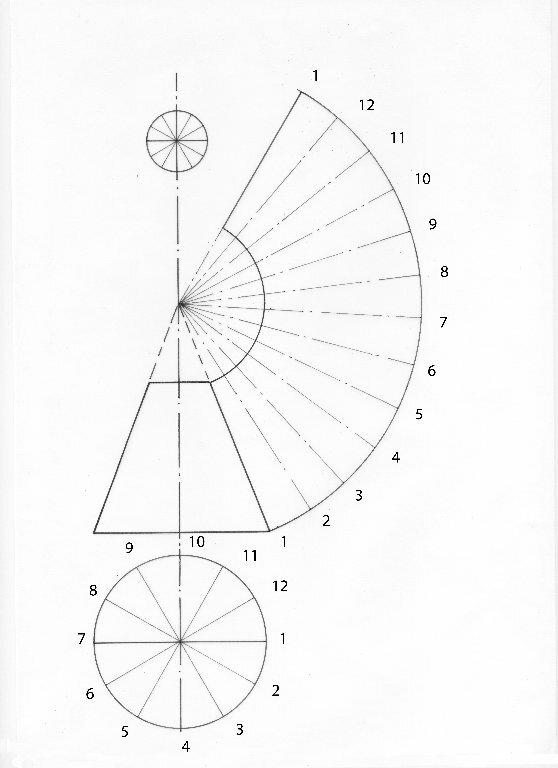 Fig 15. Casting after hammering. Fig 17. Cast weight and mould.